Recently someone I know visited the Palazzo Pitti in Florence, Italy. 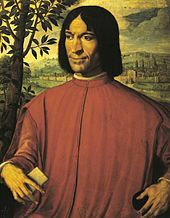 I'm told this painting of Lorenzo de' Medici by Girolamo Macchietti hangs there. We've been unable to figure out what he's holding in his right hand - what is it? It was a common practice at the time to depict men of business holding a letter or ledger in their portraits. Not the answer you're looking for? Browse other questions tagged art identification .